Sedimentary rocks form at or near the Earth's surface. Rocks made from particles of eroded sediment are called clastic sedimentary rocks, those made from the remains of living things are called biogenic sedimentary rocks, and those that form by minerals precipitating out of solution are called evaporites. Alabaster is a common name, not a geological name, for massive gypsum rock. It is a translucent stone, usually white, that is used for sculpture and interior decorations. It consists of the mineral gypsum with a very fine grain, massive habit, and even coloring. Alabaster is also used to refer to a similar type of marble, but a better name for that is onyx marble...or just marble. Onyx is a much harder stone composed of chalcedony with straight bands of color instead of the curved forms typical of agate. So if true onyx is a banded chalcedony, a marble with the same appearance should be called banded marble instead of onyx marble; and certainly not alabaster because it is not banded at all. There is some confusion because the ancients used gypsum rock, processed gypsum, and marble for the same purposes under the name alabaster. Arkose is a raw, coarse-grained sandstone deposited very near its source that consists of quartz and a significant proportion of feldspar. Arkose is known to be young because of its content of feldspar, a mineral that usually degrades quickly into the clay. Its mineral grains are generally angular rather than smooth and rounded, another sign that they have transported only a short distance from their origin. Arkose usually has a reddish color from feldspar, clay and iron oxides -- ingredients that are uncommon in ordinary sandstone. This type of sedimentary rock is similar to graywacke, which is also a rock laid down near its source. But whereas graywacke forms in a seafloor setting, arkose generally forms on land or near shore specifically from the rapid breakdown of granitic rocks. This arkose specimen is of late Pennsylvanian age (about 300 million years) and comes from the Fountain Formation of central Colorado...the same stone that makes up the spectacular outcrops at Red Rocks Park, south of Golden, Colorado. The granite that gave rise to it is exposed directly underneath it and is more than a billion years older. Asphalt is found in nature wherever crude oil seeps from the ground. Many early roads used mined natural asphalt for pavement. Asphalt is the heaviest fraction of petroleum, left behind when the more volatile compounds evaporate. It flows slowly during warm weather and may be stiff enough to shatter during cold times. Geologists use the word "asphalt" to refer to what most people call tar, so technically this specimen is an asphaltic sand. Its underside is pitch-black, but it weathers to a medium gray. It has a mild petroleum odor and can be crumbled in the hand with some effort. A harder rock with this composition is called a bituminous sandstone or, more informally, a tar sand. In the past, it was used as a mineral form of a pitch to seal or waterproof items of clothing or containers. In the 1800s, asphalt deposits were mined for use on city roads, then technology advanced and crude oil became the source for tar, manufactured as a byproduct during refining. Now natural asphalt only has value as a geological specimen. This specimen came from a petroleum seep near McKittrick in the heart of California's oil patch. It looks like the tarry stuff that roads are built but it weighs much less and is softer. The banded iron formation was laid down before 2.5 billion years ago during the Archean Eon. It consists of black iron minerals and red-brown chert. During the Archean, Earth still had its original atmosphere of nitrogen and carbon dioxide. That would be deadly for us but it was hospitable to many different microorganisms in the sea, including the first photosynthesizers. These organisms gave off oxygen as a waste product, which immediately bonded with the abundant dissolved iron to yield minerals like magnetite and hematite. Today banded iron formation is our predominant source of iron ore. It also makes beautifully polished specimens. Learn more about the ancient origin of iron and about the Archean. Bauxite forms by long leaching of aluminum-rich minerals like feldspar or clay by water, which concentrates aluminum oxides and hydroxides. Scarce in the field, bauxite is important as aluminum ore.
Breccia is a rock made of smaller rocks, like a conglomerate. It contains sharp, broken clasts while conglomerate has smooth, round clasts. Breccia ("BRET-cha") is usually listed under sedimentary rocks, but igneous and metamorphic rocks may become shattered, too. It is safest to think of brecciation as a process rather than breccia as a rock type. As a sedimentary rock, breccia is a variety of conglomerate. There are many different ways to make breccia, and usually, geologists add a word to signify the kind of breccia they're talking about. A sedimentary breccia arises from things like talus or landslide debris. A volcanic or igneous breccia forms during eruptive activities. A collapsed breccia forms when rocks are partly dissolved, such as limestone or marble. One created by tectonic activity is a fault breccia. And a new member of the family, first described from the Moon, is impact breccia. This specimen, in Upper Las Vegas Wash in Nevada, is probably a fault breccia. Chert is a sedimentary rock composed mostly of the mineral chalcedony—cryptocrystalline silica, or quartz in crystals of submicroscopic size. This type of sedimentary rock can form in parts of the deep sea where the tiny shells of siliceous organisms are concentrated, or elsewhere where underground fluids replace sediments with silica. Chert nodules also occur in limestones. Learn more about chert. This piece of chert was found in the Mojave Desert and shows chert's typical clean conchoidal fracture and waxy luster. Chert may have a high clay content and look at first glance like shale, but its greater hardness gives it away. Also, the waxy luster of chalcedony combines with the earthy appearance of clay to give it the look of broken chocolate. Chert grades into siliceous shale or siliceous mudstone. Chert is a more inclusive term than flint or jasper, two other cryptocrystalline silica rocks. See photos of all three in the chert picture gallery. Claystone is a sedimentary rock made of more than 67 percent clay-size. Coal is fossilized peat, dead plant material that once piled deep on the bottom of ancient swamps. Learn more about coal in Coal in a Nutshell and Coal Geology. Conglomerate could be thought of as a giant sandstone, containing grains of pebble size (greater than 4 millimeters) and cobble size (>64 millimeters). This type of sedimentary rock forms in a very energetic environment, where rocks are eroded and carried downhill so swiftly that they aren't fully broken down into sand. Another name for conglomerate is puddingstone, especially if the large clasts are well rounded and the matrix around them is very fine sand or clay. These specimens could be called puddingstone. A conglomerate with jagged, broken clasts is usually called a breccia, and one that is poorly sorted and without rounded clasts is called a diamictite. The conglomerate is often much harder and resistant than the sandstones and shales that surround it. It is scientifically valuable because the individual stones are samples of the older rocks that were exposed as it was forming -- important clues about the ancient environment. See more examples of conglomerate in the Conglomerate Gallery and other sedimentary rocks in the Sedimentary Rocks Gallery. Coquina ("co-KEEN-a") is a limestone composed chiefly of shell fragments. It's not common, but when you see if you want to have the name handy. Coquina is the Spanish word for cockleshells or shellfish. It forms near shore, where wave action is vigorous and it sorts the sediments well. Most limestones have some fossils in them, and many have beds of shell hash, but coquina is the extreme version. A well-cemented, strong version of coquina is called coquinite. A similar rock, composed chiefly of shelly fossils that lived where they sit, unbroken and unabraded, is called a coquinoid limestone. That kind of rock is called autochthonous (aw-TOCK-thenus), meaning "arising from here." Coquina is made of fragments that arose elsewhere, so it is allochthonous (al-LOCK-thenus). See more photos in the Coquina Gallery. Diamictite is a terrigenous rock of mixed-size, unrounded, unsorted clasts that is not breccia or conglomerate. The name signifies only observable matters without assigning a particular origin to the rock. Conglomerate, being made of large rounded clasts in a fine matrix, is clearly formed in water. Breccia, being made of a finer matrix bearing large jagged clasts that may even fit together, is formed without water. Diamictite is something that is not clearly one or the other. It is terrigenous (formed on land) and not calcareous (that's important because limestones are well known; there's no mystery or uncertainty in a limestone). It is poorly sorted and full of clasts of every size from clay to gravel. Typical origins include glacial till (tillite) and landslide deposits, but those cannot be determined just by looking at the rock. Diamictite is a non-prejudicial name for a rock whose sediments are very close to their source, whatever that is. Diatomite ("die-AT-amite") is an unusual and useful rock made up of the microscopic shells of diatoms. It is a sign of special conditions in the geologic past. This type of sedimentary rock may resemble chalk or fine-grained volcanic ash beds. Pure diatomite is white or nearly white and quite soft, easy to scratch with a fingernail. When crumbled in water it may or may not turn gritty but unlike degraded volcanic ash, it doesn't turn slippery like clay. When tested with acid it will not fizz, unlike chalk. It is very lightweight and may even float on water. It can be dark if there is enough organic matter in it. Diatoms are one-celled plants that secrete shells out of silica that they extract from the water around them. The shells, called frustules, are intricate and beautiful glassy cages made of opal. Most diatom species live in shallow water, either fresh or salt. Diatomite is very useful because silica is strong and chemically inert. It's widely used to filter water and other industrial liquids including foods. It makes excellent fireproof lining and insulation for things like smelters and refiners. And it's a very common filler material in paints, foods, plastics, cosmetics, papers and much more. Diatomite is part of many concrete blends and other building materials. In powdered form it's called diatomaceous earth or DE, which you can buy as a safe insecticide -- the microscopic shells injure insects but are harmless to pets and people. It takes special conditions to yield a sediment that is nearly pure diatom shells, usually cold water or alkaline conditions that do not favor carbonate-shelled microorganisms (like forams), plus abundant silica, often from volcanic activity. That means polar seas and high inland lakes in places like Nevada, South America, and Australia...or where similar conditions existed in the past, as in Europe, Africa, and Asia. Diatoms are not known from rocks older than the Early Cretaceous period, and most diatomite mines are in much younger rocks of Miocene and Pliocene age (25 to 2 million years ago). This sedimentary rock was first described by the French mineralogist Déodat de Dolomieu in 1791 from its occurrence in the southern Alps. The rock was given the name dolomite by de Saussure, and today the mountains themselves are called the Dolomites. What Dolomieu noticed was that dolomite looks like limestone, but unlike limestone, it does not bubble when treated with weak acid. The mineral responsible is also called dolomite. Dolomite is very significant in the petroleum business because it forms underground by the alteration of calcite limestone. This chemical change is marked by a reduction in volume and by recrystallization, which combines to produce open space (porosity) in the rock strata. Porosity creates avenues for oil to travel and reservoirs for oil to collect. Naturally, this alteration of limestone is called dolomitization, and the reverse alteration is called dolomitization. Both are still somewhat mysterious problems in sedimentary geology. Wacke ("wacky") is a name for a poorly sorted sandstone -- a mixture of grains of sand, silt and clay size. Graywacke is a specific type of wacke. Wacke contains quartz, like other sandstones, but it also has more delicate minerals and small fragments of rock (lithics). Its grains are not well rounded. But this hand specimen is, in fact, a graywacke, which refers to a specific origin as well as a wacke composition and texture. The British spelling is "greywacke." Graywacke forms in the seas near fast-rising mountains. The streams and rivers from these mountains yield fresh, coarse sediment that doesn't fully weather into proper surface minerals. It tumbles from river deltas down-slope to the deep seafloor in gentle avalanches and forms bodies of rock called turbidites. This graywacke is from a turbidite sequence in the heart of the Great Valley Sequence in western California and is roughly 100 million years old. It contains sharp quartz grains, hornblende and other dark minerals, lithics and small blobs of claystone. Clay minerals hold it together in a strong matrix. Ironstone is a name for any sedimentary rock that is cemented with iron minerals. There are actually three different kinds of ironstone, but this one is the most typical. The official descriptor for an ironstone is ferruginous ("fer-ROO-jinus"), so you could also call these specimens ferruginous shale -- or mudstone. This ironstone is cemented together with reddish iron oxide minerals, either hematite or goethite or the amorphous combination called limonite. It typically forms discontinuous thin layers or concretions, and both can be seen in this collection. There may also be other cementing minerals present such as carbonates and silica, but the ferruginous part is so strongly colored that it dominates the rock's appearance. Another type of ironstone also called clay ironstone, occurs associated with carbonaceous rocks like coal. The ferruginous mineral is siderite (iron carbonate) in that case, and it's more brown or gray than reddish. It contains a lot of clay, and whereas the first kind of ironstone may have a tiny amount of iron oxide cement, clay ironstone has a substantial amount of siderite. It too occurs in discontinuous layers and concretions (which may be septaria). The third main variety of ironstone is better known as banded iron formation, best known in large assemblages of thin-layered semimetallic hematite and chert. It formed during Archean time, billions of years ago under conditions unlike any found on Earth today. In South Africa, where it's widespread, they may call it banded ironstone but a lot of geologists just call it "biff" for its initials BIF. Limestone is usually made of the tiny calcite skeletons of microscopic organisms that once lived in shallow seas. It dissolves in rainwater more easily than other rocks. Rainwater picks up a small amount of carbon dioxide during its passage through the air, and that turns it into a very weak acid. Calcite is vulnerable to acid. That explains why underground caverns tend to form in limestone country, and why limestone buildings suffer from acid rainfall. 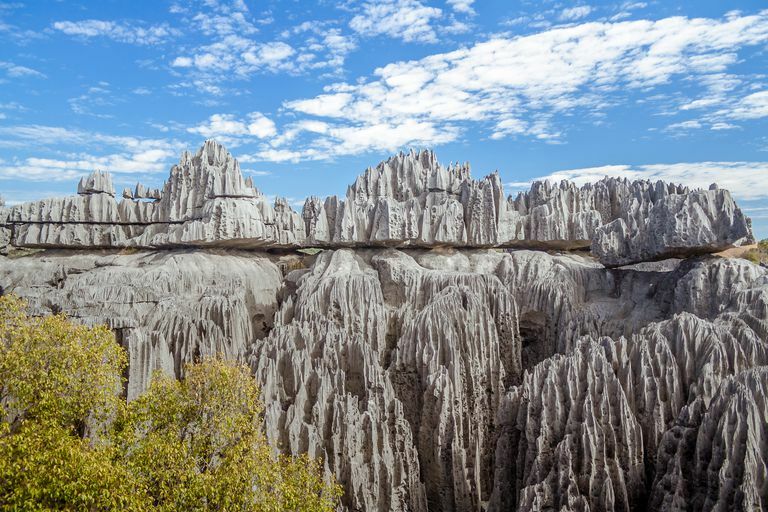 In dry regions, limestone is a resistant rock that forms some impressive mountains. Under pressure, limestone changes into marble. Under gentler conditions that are still not completely understood, the calcite in limestone is altered to dolomite. See other limestone pictures in the Limestone Gallery. Peat is a deposit of dead plant material, the precursor to coal and petroleum. It is plant matter that is partially decomposed under conditions of no oxygen. When dug from the ground peat is about 75 percent water by weight; once dried it is about 60 percent carbon and makes a useful fuel in many regions. This type of sedimentary rock forms large and widespread deposits in the northern latitudes, where wet ground (peat bogs and fens) and abundant plant growth favor its preservation. Peat turns slowly into coal with burial and pressure as gentle heat drives out light hydrocarbons. These volatile compounds become petroleum. Porcellanite ("por-SELL-anite") is a rock made of silica that lies between diatomite and chert. Unlike chert, which is very solid and hard and made of microcrystalline quartz, porcellanite is composed of silica that is less crystallized and less compact. Instead of having the smooth, conchoidal fracture of chert, it has a blocky fracture. It also has a duller luster than chert and is not quite as hard. The microscopic details are what is important about porcellanite. X-ray examination shows that it is made of what's called opal-CT, or poorly crystallized cristobalite/tridymite. These are alternative crystal structures of silica that are stable at high temperatures, but they also lie on the chemical pathway of diagenesis as an intermediate stage between the amorphous silica of microorganisms and the stable crystalline form of quartz. Rock gypsum is an evaporite rock that forms as shallow sea basins or salt lakes dry up enough for the mineral gypsum to come out of solution. Rock salt is an evaporite composed mostly of the mineral halite, ​It is the source of table salt, as well as sylvite. Learn more about salt. Sandstone forms where sand is laid down and buried -- beaches, dunes and seafloors. Usually, sandstone is mostly quartz. Learn more about it here. Shale is a claystone that is fissile, meaning that it splits into layers. Shale is usually soft and does not crop out unless harder rock protects it. Geologists are strict with their rules on sedimentary rocks. Sediment is divided by particle size into gravel, sand, silt, and clay. Claystone must have at least twice as much clay as silt and no more than 10 percent sand. It can have more sand, up to 50 percent, but that is called a sandy claystone. (See all this in the Sand/Silt/Clay ternary diagram.) What makes a claystone shale is the presence of fissility; it splits more or less into thin layers whereas claystone is massive. Shale can be fairly hard if it has a silica cement, making it closer to chert. Typically, it is soft and easily weathers back into clay. Shale may be hard to find except in roadcuts, unless a harder stone on top of it protects it from erosion. When shale undergoes greater heat and pressure, it becomes the metamorphic rock slate. With still more metamorphism, it becomes phyllite and then schist. Siltstone is made of sediment that is between sand and clay in the Wentworth grade scale; it's finer grained than sandstone but coarser than shale. Silt is a size term used for material that's smaller than sand (generally 0.1 millimeter) but larger than clay (around 0.004 mm). The silt in this siltstone is unusually pure, containing very little sand or clay. The absence of clay matrix makes siltstone soft and crumbly, even though this specimen is many millions of years old. Siltstone is defined as having twice as much silt as clay. The field test for siltstone is that you can't see the individual grains, but you can feel them. Many geologists rub their teeth against the stone to detect the fine grit of silt. Siltstone is much less common than sandstone or shale. This type of sedimentary rock usually forms offshore, in quieter environments than the places that make sandstone. Yet there are still currents that carry off the finest clay-size particles. This rock is laminated. It's tempting to suppose that the fine lamination represents daily tidal surges. If so, this stone might represent about a year of accumulation. Like sandstone, siltstone changes under heat and pressure into the metamorphic rocks gneiss or schist. Travertine is a kind of limestone deposited by springs. It is an odd geological resource that can be harvested and renewed. Groundwater traveling through limestone beds dissolves calcium carbonate, an environmentally sensitive process that depends on a delicate balance between temperature, water chemistry and carbon dioxide levels in the air. As the mineral-saturated water encounters surface conditions, this dissolved matter precipitates in thin layers of calcite or aragonite -- two crystallographically different forms of calcium carbonate (CaCO3). With time, the minerals build up into deposits of travertine. The region around Rome produces large travertine deposits that have been exploited for thousands of years. The stone is generally solid but has pore spaces and fossils that give the stone character. The name travertine comes from the ancient deposits on the Tibur River, hence lapis tiburtino. See more photos and learn more detail in the Travertine Picture Gallery. "Travertine" is sometimes used to mean cavestone, the calcium carbonate rock that makes up stalactites and other cave formations. What Are the 3 Main Rock Types for Climbing? What Are the 11 Types of Holes You May Discover in Rocks?